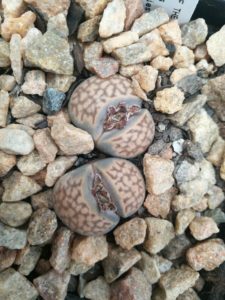 The name Lithops is derived from the Ancient Greek words λίθος, or Lithos, which means “stone” and ὄψ or Ops, meaning “face”. Welcome back to the Succulent Series, where each week, we teach you about a new and exciting succulent variety. Lithops are slow growing plants which have evolved to look like stones. This is their way of protecting themselves from being eaten by wild animals in their natural environment- the harsh dry climates scattered around Southern Africa. Originating from the Namaqualand in the Northern Cape, these Lithops are accustomed to dry winter rainfall areas. The red-brown “islands” of colour show against a grey background. The leaves grow and are separated by a “window” from which a satin-leafed yellow flower will appear in April. After flowering, the leaf-pair dies and another pair emerges. 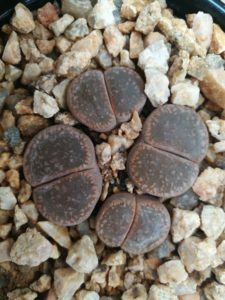 The rule of thumb is that one should not water the Lithops at all from when it flowers, to when the new leaf pair is fully grown. This is an annual cycle. A very light hand with water is necessary to prevent bursting leaves. In our winter, do not water at all. They prefer to be dry. Add coarse small gravel to succulent mix for an ideal potting medium. Full sunlight is essential. Lithops originate from the vast dry outdoors where they are accustomed to intense sun. Lithops make for an ideal balcony plant, where they can get full sun year round but where they can be moved under cover when it rains. They go dormant in summer and grow during winter. Flowers will appear in late summer. Lithops grow a new set of leaves annually. Over time an attractive and prized bunch of “pebbles” will develop in happy plants. Lithops live most of their lives almost completely buried under soil, with only their truncated faces visible. They are clever plants that mimic the surrounding rocks; they are very much the chameleons of the succulent world. The minimum amount of watering, and a gritty soil type will make for happy plants with generous amounts of satin-leafed flowers. The Window between the leaves of lithops allows light to travel to the centre of the leaves and aids in photosynthesis.